Are you interested in improving the productivity of your call center agents? Do you make lots of outbound calls? Are you tired of the mundane task of leaving the same voicemail over and over? Do you feel like so much of your time is wasted repeating the same message throughout the day? Then you need 3CX Auto Voicemail! With 3CX Auto Voicemail, when you are routed to a customer's voicemail box, you can let 3CX leave the voicemail for you. Simply select a recording from your list and 3CX will immediately remove you from the call while 3CX leaves the message for you. 3CX Auto Voicemail let's you instantly get to the next call without wasting time leaving yet another voicemail message. 3CX Auto Voicemail is conceptually a very simple application, but it solves a real sink-hole problem... call center agent's time wasted leaving the same voicemails over and over. With every job we have tasks we wish we could avoid. With this tool, hopefully we make the job of a call center agent a lot better -- by removing a tedious chore, while allowing staff to focus on being more productive. 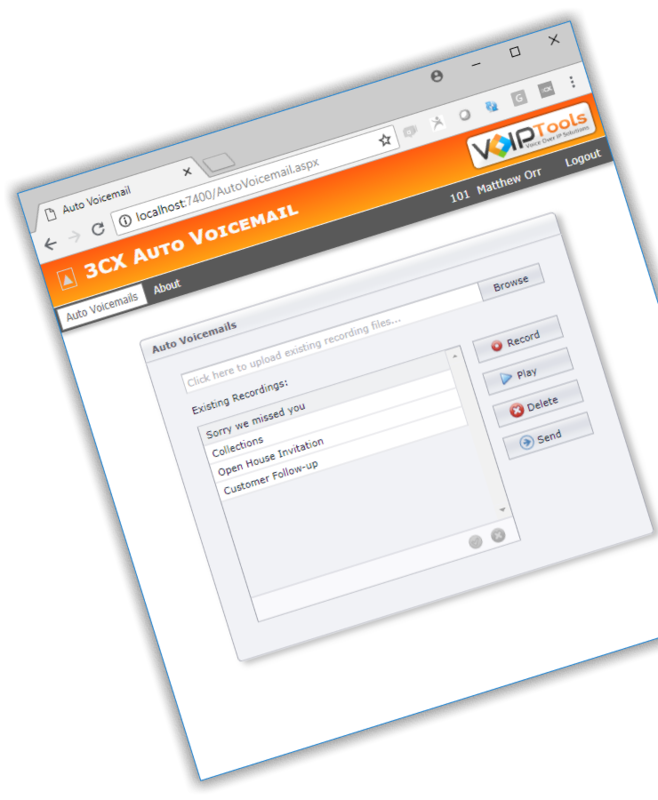 Because Auto Voicemail is a web application there is nothing to install on the client computer. And updates are instantly available for all users. Creating a new recorded message is simple. 1. Type a name for the recording, 2. 3CX will call your extension, 3. Record your message. A new recording will show up in your list. In addition to recording messages using your phone, you can also upload professionally recorded messages to give that extra "polish" to your communications. When you select a prerecorded message, the call is instantly transferred to a special extension that plays your message. No ringing. No "transferring your call" message. No pause. The customer experience is perfect. Eliminate the tedium and draining repetition of speaking the same voicemail over and over every day. We can improve job satisfaction by eliminating a an unpleasant task. Develop a carefully crafted message and deliver that message consistently every time. With Auto Voicemail you can carefully script your message, record the message with just the right inflection, then guarantee your message is perfect every time. We made sure using 3CX Auto Voicemail is pathetically simple to use because we know if it isn't easy, people won't uses. It couldn't be any easier! Our good friends at Electronic Frontier Ltd (EFL) have created an informational video to showcase the features and user interface of 3CX Auto Voicemail. EFL is the premiere 3CX distributor in the UK. Special thanks to Eddie for taking the time to create the video! Do I need to install anything on my client PC? There is nothing to install on your workstations. Simply install 3CX Auto Voicemail on your server, and all your agents get access instantly. They will never know you didn't leave the message in their voicemail box. There is no delay, no audio quality issues, no ringing. It's exactly as if you spoke the voicemail yourself. Is 3CX Auto Voicemail licensed per agent? Does everyone share the same prerecorded voicemails? No! You make the recordings using your own voice so it sounds exactly as if the message was spoken by you. Everyone has their own personalized recordings. 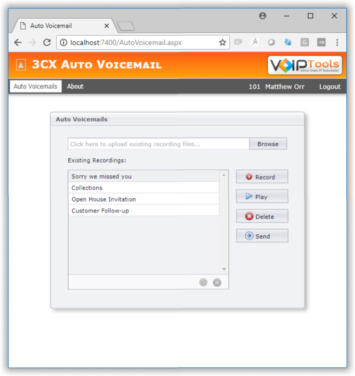 Is 3CX Auto Voicemail available for the Linux version of 3CX? Currently we support the Windows version of 3CX version 15.5 Pro. We will start development of Linux versions in the first quarter of 2018.